Sands Ocean Club Resort in Myrtle Beach, S.C. is home to the famous Ocean Annie's Beach Bar. If you want a Caribbean-style vacation without the long flight, look no further than beautiful, sunny Myrtle Beach! 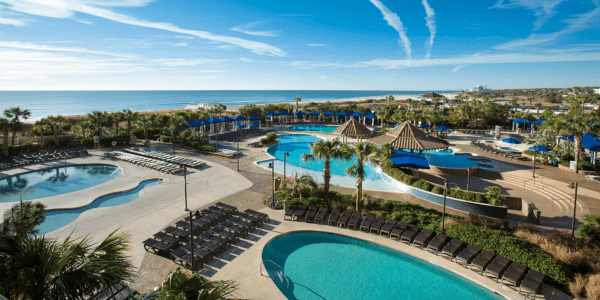 In addition to sunshine and weather that can rival that in the tropics, many Myrtle Beach hotels also offer swim-up pool bars and poolside cabanas to help you beat the heat and relax. We’ve been all around the Grand Strand, and these are some of our favorite hotel pool bars. Sands Ocean Club Resort is a clear favorite among beach fans. Ocean Annie’s Beach Bar has been a hit for visitors and locals for years and it’s still just as big every summer. The beach bar is known for their mixed drinks and live bands and is the perfect spot for beach bums. Sandals Lounge is another great spot to grab a drink at Sands Ocean Club. The resort offers one-, two- and three-bedroom accommodations. The Marco Polo Pool Bar and Grill is a popular hangout spot at The Caravelle Resort. With direct access to the pools and beach, you’re in the midst of all of the action. Stop by for daiquiris, beer and other beverages plus burgers, hot dogs and grilled chicken. The pool bar is open during the warmer months of the year. For some cocktails indoors, head to Liquids Lounge. The Caravelle has a variety of rooms and suites to suit any size group. Find your new favorite boat drink at Splash Oceanfront Beach Bar and Grill located at Coral Beach Resort. The bar serves up a variety of drinks with live poolside entertainment during the summer months. Brave souls can sing their hearts out on-stage during karaoke nights. Coral Beach offers endless amenities and was voted Best Family Accommodations” by the Travel Channel. Take your pick of condos, rooms and one-bedroom units. The voodoo juice is the drink of choice for fans of the Tiki Hut at Compass Cove Oceanfront Resort. The bar is located poolside on the deck at the Schooner building. The Crow’s Next is another popular choice for cool cocktails and has great ocean views. 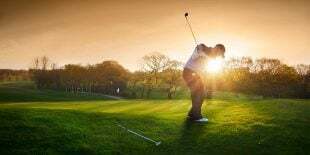 Compass Cove is home to a variety of amenities to meet all of your group’s interests plus a few extras. The resort consists of three buildings with a variety of room types. North Beach Plantation’s Caribbean-themed pool amenities are second to none along the Grand Strand. Add their fabulous swim up pool bar and you’ve got a great place to hang out all day. The bar was voted #1 swim up pool bar in the United States by TripAdvisor and is #6 in the world. The luxurious condos offer one to five bedrooms with many different layouts and amenities like Jacuzzi tubs and ocean views. The Marriott Resort and Spa at Grande Dunes is located near a more residential stretch of beaches in Myrtle Beach. Their poolside bar Ocean Blu is popular among visitors and locals for a quick lunch and tasty cocktails. The poolscape features a number of outdoor pools, whirlpools and even a waterslide. Book a room with one king or two doubles for your next Myrtle Beach vacation or business trip. Captain’s Quarters Resort may be best known for their indoor excitement at the Level 6 Bowling and Bar but there’s also a great spot near the pool. The Pool Bar is open seasonally and serves tasty frozen drinks plus burgers, hotdogs and sandwiches right alongside their pools. The resort offers so many different accommodations ranging from oceanfront efficiencies to king and double suites. Order a Banana Breeze cocktail from the Malibu Beach Bar and Oceanfront Snack Bar at Sea Crest Oceanfront Resort. Fans say it’s the best drink they serve! They also offer great live entertainment and karaoke nightly and weekly themed nights. The resort is home to nine pool attractions and is located in a happening area of the beach. Sea Crest offers over a dozen different types of accommodations so you’re sure to find the best place for your family to stay. hotel BLUE is home to one of Myrtle Beach’s only swim-up pool bars. It was the first one of its kind in Myrtle Beach and serves up tropical drinks, ice cold beers and even a few non-alcoholic selections. You don’t have to wander too far for a great night’s rest after a long day at the pool bar — they have tons of great rooms and suites right upstairs.